Two newfound galaxies appear to be devoid of the substance, paradoxically providing more proof dark matter exists. Even as some researchers hailed the finding, others aired their doubts, criticizing measurements of the galaxy’s distance and motion. The stakes are high: If the galaxy does in fact lack dark matter, that would paradoxically bolster the case for the material’s existence. Now the original team is back with additional evidence confirming their initial discovery, plus a newfound second galaxy that appears to show the same thing—or, rather, the lack thereof. In terms of information, starlight contains multitudes. By splitting light into its constituent colors, a practice called spectroscopy, scientists can determine a star’s makeup, age, direction through the cosmos and speed. Much of that information is conveyed in spectral lines—linear features embedded in a star’s spectrum due to the emission or absorption of various chemical elements. The Keck instrument measured the spectra for roughly 10 million stars in the DF2 galaxy. The size of the spread between the fastest and slowest stars in the galaxy gives an idea of how much matter interacts with them. The more matter present—dark or otherwise—the greater the spread in the stellar velocities. “To our own surprise, we measured extremely narrow [spectral] lines, which leaves very little room for more mass other than the mass contributed by the stars in the galaxy,” Danieli says. No room for dark matter. Nicolas Martin, an astronomer at the University of Strasbourg in France, was among the critics of the original paper. In subsequent work published last year, he argued it is too difficult to estimate the DF2 galaxy’s mass based on surrounding star cluster motions. But Martin says he was reassured by the latest results from Danieli and Emsellem. “This is only thanks to brand-new instruments that arrived on the biggest telescopes on the planet that this is feasible. Several astronomers are scratching their heads over how such galaxies could form in the first place, and where the dark matter went. One possibility is the gravitational pull of a much larger galaxy nearby stripped off the dark matter, Boylan-Kolchin says. Or DF2 and DF4 may not be galaxies after all, just modest collections of stars masquerading as such; in that case, these isolated groups of stars may have formed from colliding jets of gas streaming from another location. Or there could be more humdrum scenarios such as the galaxies’ orientation with respect to Earth being unfavorable for obtaining accurate spectral measurements of their motions, according to Martin. “I’m a little torn about the system. It’s certainly intriguing and it needs to be explained, but it could well be that the explanation is quite mundane, and it’s just the wrong angle or something like that,” he says. 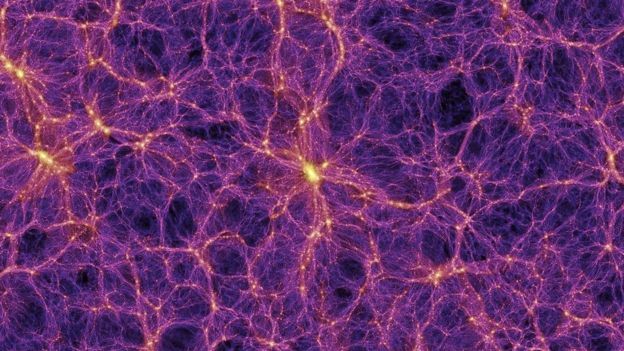 Proponents of such ideas argue the sculpting most astronomers attribute to dark matter may actually be a phenomenon that arises from physics we cannot yet comprehend. But if that were the case, those conditions would obtain everywhere. Galaxies like NCG 1052 DF2 and DF4 would be subject to those alternative gravities, too—and those theories would need to somehow explain such galactic oddities (which they presently do not). And so the galaxies’ sheer peculiarity suggests these alternatives are wrong, and dark matter must indeed be the cause.